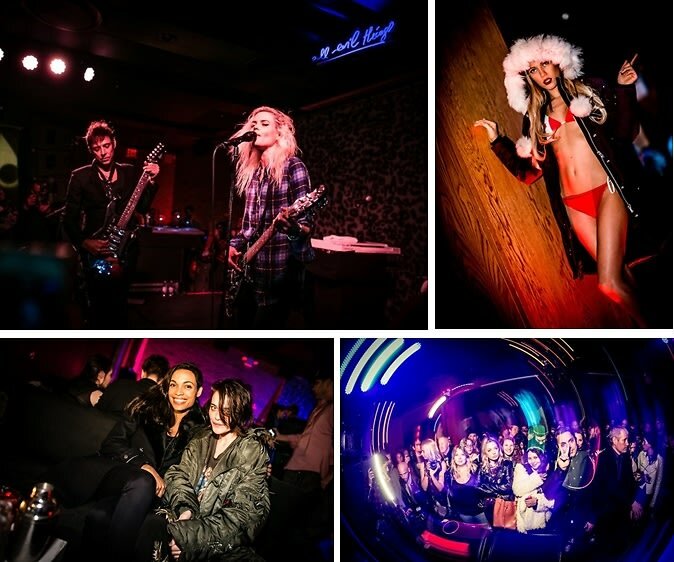 "Chill" took on a whole new meeting last night at the Dream Downtown, where Canadian sportswear brand, Moose Knuckles, celebrated its U.S. launch with a party presented by Nur Khan and Adam Nelson. With the Gallery space at the hotel turned into a cross between a rock star's lair and a Northern expedition, guests snapped photos with everything from bears in hockey uniforms to vats of maple syrup and indoor snow mobiles. With faux snow-covered trees and a giant Moose-shaped ice luge in the center of the room, it's no wonder why the party was so cool, though guests stayed warm with Dobel Tequila cocktails and specialty shots straight from the ice luge. Moose Knuckle models, on the other hand, paired their bikinis with sporty outerwear by the brand in order to stay toasty. It didn't take long for things to heat up, of course, when Alison Mosshart and Jamie Hince of The Kills took to the stage. The wildly energetic, hour-long set included fan favorites like "U R A Fever," "Black Balloon," and "Sour Cherry," which caused a stir of singing-along as well as a massive mosh pit. Who was there: Guests included Will Poho, Courtney Fallow, Rosario Dawson, Sky Ferreira, Alison Mosshart, Jamie Hince, Cory Kennedy, Karen Elson, Tabitha Simmons, Keegan Singh, Nur Khan, Vikram Chatwal, Tennessee Thomas, Danny Masterson, Harif Guzman, Rachel Hilbert, Ally Kemper, Mario Sorrenti, Phillip Bloch, Noah Stern, AndrewAndrew, DJ Cash, Bob Gruen, BP Fallon, Courtney McKenna, Terese Pagh, Donald Levy, Michael Tommasiello, Lorna Solano, Wael Davis, Dean Dodos, Faran Krentcil, Kylie Case, and Mila De Wit. Go HERE for more photos by Josh Wong and tag yourself and your friends!